Popular Malaysian 4G Mobile Internet Service Provider, YES, in collaboration with OffGamers and Rimasuri (RMS), recently announced that a Vocaloid Solo Singing Competition will be held as part of the upcoming YES Tech Gaming League. The competition will be held at Ground Floor Sungei Wang Plaza, Bukit Bintang, on the 23rd of June, 2012. Participants will stand a chance to win attractive prizes, and all that is needed from participants is to sing a Vocaloid original song on stage. 1. No purchase or fee is required to enter this competition. 3. The competition is open to the first 20 complete entries. 4. Registration will be closed as soon as the first 20 complete entries quota is met. In any case 1 of the first 20 participants cannot make it, then the invitation to entry no. 21 will be given & so forth. 5. All contestants will be informed by email if you entry is successful. 1. This competition is open to all Malaysians above the age of 13. 2. Participants under the age of 18 will require consent from a parent or guardian to enter the competition. 3. Song selection is only limited to Vocaloid performed songs. 4. Professional entertainers (union musicians or whose talent is a principle source of income) & those who have sung on a recording which is meant to be sold are NOT permitted to enter. 5. All information furnished by the contestant to the organizer should be truthful to the best of knowledge of the contestant. 6. Organizers reserve the right to change the rules and regulations without prior notice. 7. The judges’ decision is final. No appeals will be entertained. 1. There will only be one (1) round for this competition. 2. The order of contestants will be determined by the drawing of lots. 3. Song duration must be no longer than 3 minutes. 4. A signal will be given to signify 2:30 minutes passed. Audio playback will be cut off at 3 minutes. 5. Audio playback format can be in CD (clearly labeled with your name & song title) or on mp3 format on a USB flash drive. We strongly suggest having both & even making an extra CD copy as back up. 6. All audio playback materials should be submitted when the contestants report themselves on the event day which is Saturday, 23rd June 2012 at 1pm. 7. After performance, the contestants are responsible to collect their playback materials from the audio console. 8. The organizers will not be held responsible for any misplacement of the audio play back material. 2. A maximum of 5 points will be given for each category mention above (i. – iv.) which ads up to a maximum total of 20 points. 3. Contestants cosplaying the same vocaloid & same vocaloid version will receive more favour in scoring. 4. Contestants maybe required to perform their song again for the judges should it be requested upon. 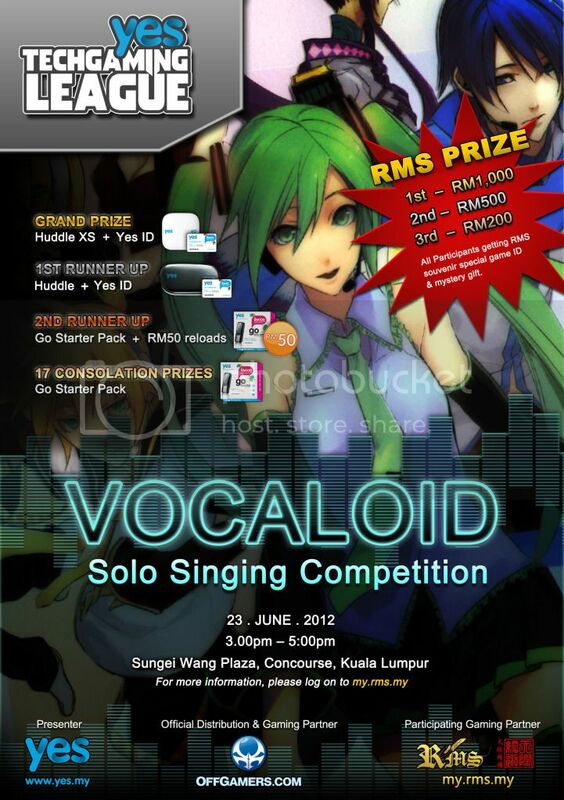 So Vocaloid fans of Malaysia, any of you dare to take up the challenge? If so, do send in your registration as soon as possible before the 20-participant quota is met!